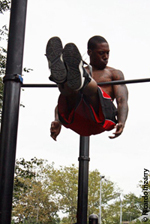 “The gym is cool for people who do it, but you can train outside, and for free.” That’s the logic that got Edward Checo, founder of Barstarzz, staging human flags on everything from neighborhood jungle gyms to street posts in New York City’s Times Square. “I don’t believe in training biceps this way and triceps that wayall of my stuff is full body. It teaches the body to work together rather than separately,” he explains. But that doesn’t mean he slacks when he trains others. 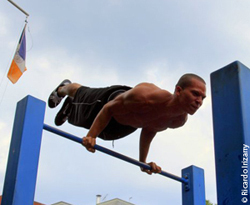 “I always keep track by how many push-ups, pull-ups they can do or how long they can last during the cardio session. Then by seeing how well they are progressing, I show them new moves. You can tell how people are moving their body weight if they are progressing or not.” Checo backs this training philosophy by sharing that he lost 30 pounds over the course of a year with Barstarrz.